Don’t own a camper or RV? No problem. Our newly built cabins are available to rent and are offered at special member rates! These lakeview cabins offer stunning views across Rainbow Lake and a deck for you to relax and enjoy it. 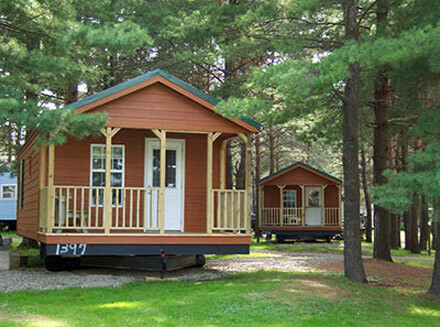 These cabins are available in one, two or three bedroom units, sleeping 2-6 campers. They’re also fully equipped with a living room, bathroom facilities, and kitchen with pots and pans, cooking supplies, dinnerware, utensils, a stove, and refrigerator. Just bring towels and linens and you’ll be settled in within a matter of minutes!